the uneven ray pointing up, five petal rose at left (the uneven petal pointing up) and waxing crescent at right. Inner and outer pearl circle. the uneven ray pointing down, five petal rose at left (the uneven petal pointing down) and waxing crescent at right. Inner and outer pearl circle. 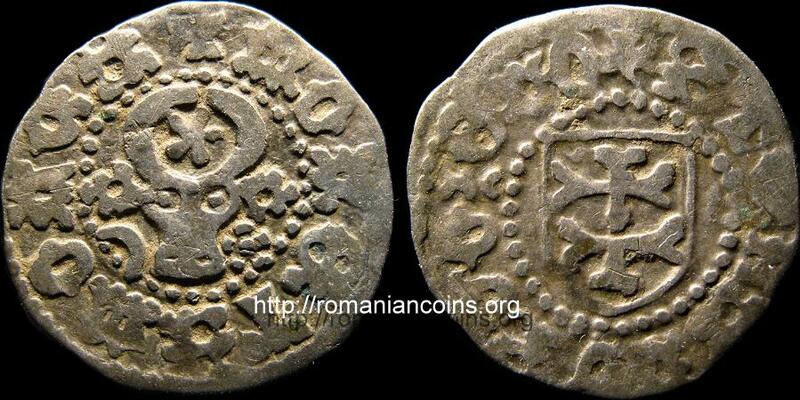 The pictures of the second coin are present on Romanian coins through the kind permission of Mr. Lucian Solcan. 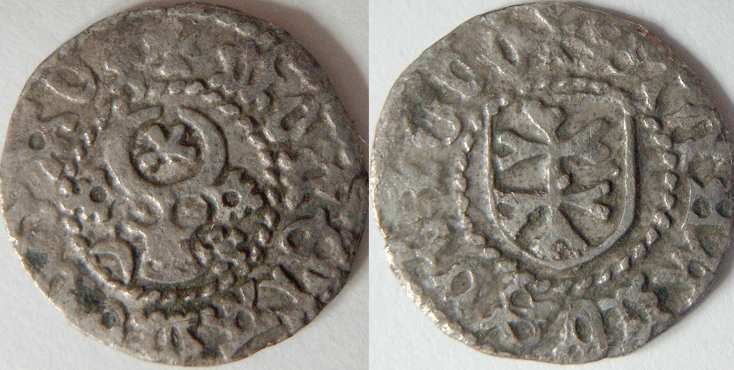 According to the Bible of Romanian numismatics, Monede şi bancnote româneşti by George Buzdugan, Octavian Luchian and Constantin Oprescu (1976), this old coin is classified as a type II b gros. This classification was made by the renown Romanian numismatist Mr. Octavian Iliescu. The II b category differs from the II a category (presented on the previous page) by the inverted positions of the crescent and rose on the urus snout sides. The type I differs from type II mainly by the design inside the shield and by the shape of letter A (at type II letter A has three legs instead of two).